I can't find a standalone site for ANGG, but the dresses on Oak's website are to die for. Anybody know anything more about this designer? Update: Thanks to a lovely, but anonymous, comment I now have a link to ANGG's website! My name is Jane and I'm a hypocrite: Less than a month after swearing I would not end up on Twitter, I'm on Twitter. I have a story all worked out about how I need to be there because I work in new media and how can I claim to be Web 2.0. blah blah blah... If you're not disgusted with me, let's follow each other! Or, do I need a new tag for hypocrisy? 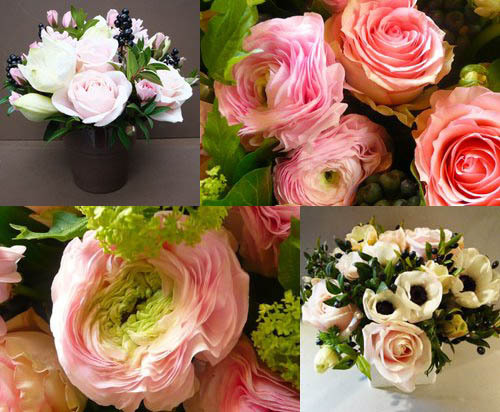 Absolutely stunning floral arrangements from Fleurs, Fruits, Feuillages. 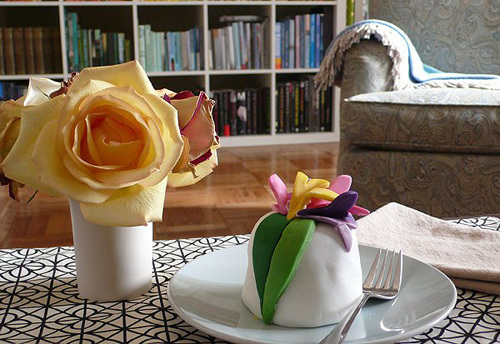 Do you take inspiration to the flower market with you, or do you let the flowers call to you when you get there? I often go with something in mind, but change my mind based on what looks particularly appealing. 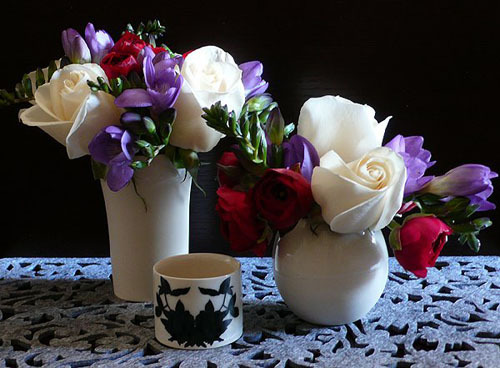 Still, I never tire of looking at inspiring arrangements, stored away in my mind for another time. Anna over at Door Sixteen wallpapered her study on the weekend and I can't get it out of my head. I desperately want to wallpaper and her dark and light room is so up my alley, it nearly hurts to look at it. In fact, every choice Anna makes for her house is completely bang on and especially impressive since they seem to do all the work themselves! Anna also posted this brilliant video that's got me thinking I can actually do this wallpapering thing! How to Wallpaper from ferm LIVING shop on Vimeo. Fur things that I would buy this instant from J. Crew if it weren't for my spending fast. We all love to window shop, but do you actually fill up virtual shopping carts? I do. And when I read a magazine I play games with myself too. Sometimes, I'm only allowed pick 3 objects from the entire magazine. 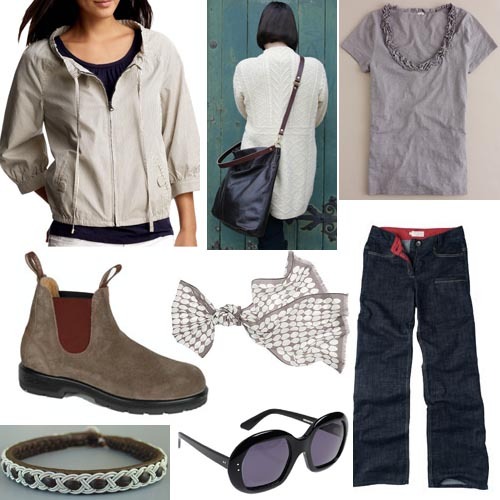 Other times, I have to create one complete outfit that I actually would wear from a magazine. If you run a business or make a product that fits my style and are interested in sponsoring Ill Seen, Ill Said, please contact me at jane[at]janeflanagan[dot]ca for details. I'm priced to please small businesses, Etsy sellers and artists, even in this tough economic climate. And I handpick all my sponsors, meaning they're a true fit for my blog and readers! I've been adding faves to my Etsy profile like a mad woman lately. Here are some of my new favourites. You can view them all here. 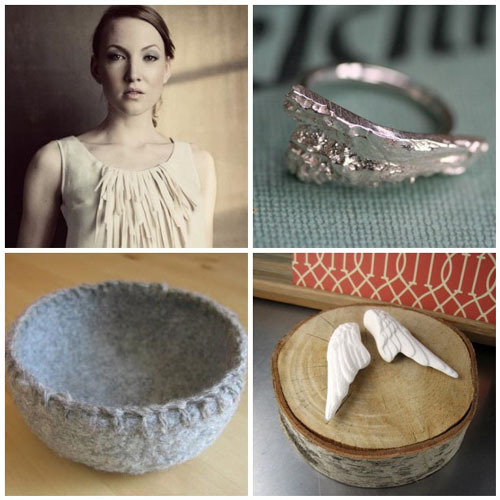 Products: Anemone Tank from Janeanemarie, Iceberg ring from eRosasjewelry, Felted Bowl - Grey with Blanket Stitch by KoboH, Porcelain Wings by BROOKLYNrehab. 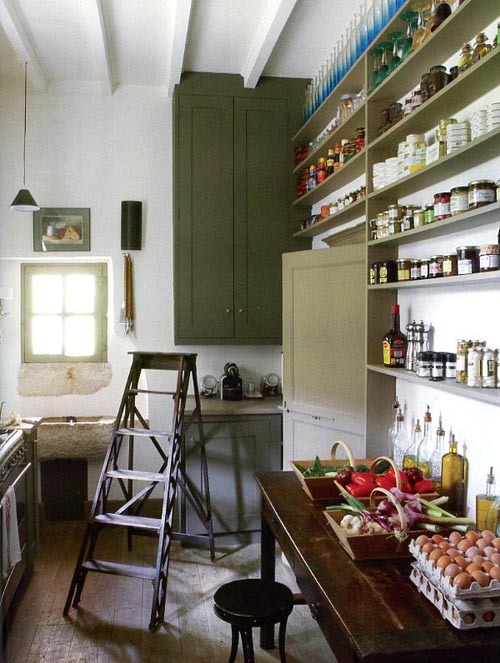 I love this rustic kitchen with its pantry shelving exposed along the side wall. I'm rather partial to small kitchens that are next to, but not open to, a dining room. 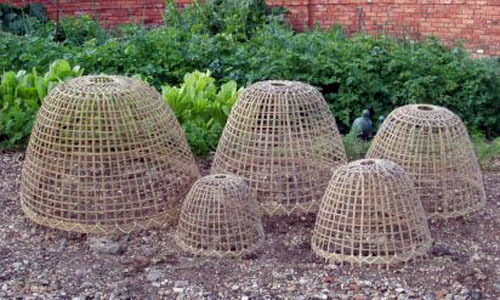 I know this is very unfashionable, (and unpractical for those who need to keep watchful eyes on kids while they cook). But, I like the idea of squirreling away in a kitchen, taking a breather from company and cooking up a storm in perfect solitude. 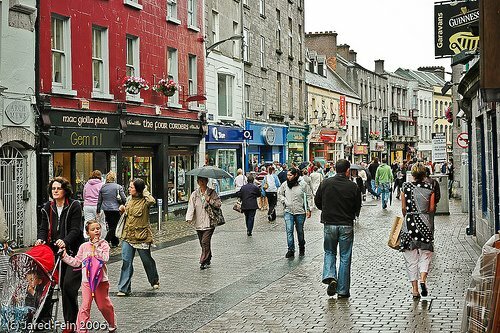 I spent many summers in Galway when I was growing up. So, when Caroline K left a comment asking what she should pack for her summer there, I was so excited and happy for her. First, a little temperature overview: Irish summers are mild by most standards, cool by some. Days in the summer months can be as low as 10 celsius (50 fahrenheit) and top out around 18 celsius (65 fahrenheit)... it's no wonder I'm such a wuss in Toronto's searing 30-degree summers! And you can expect rain, especially on the West Coast, where Galway is located. Layering up and wearing something wooly is the best solution to Irish damp. 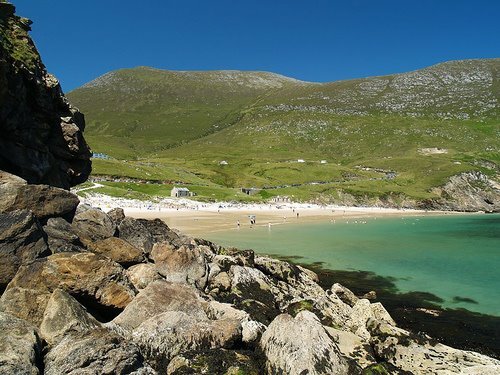 That said, the Atlantic is warm on the Irish coast, thanks to the Gulf Stream, so the minute the sun cracks the sky, there'll be ice-creams, sea-swimming and the whole nine yards. 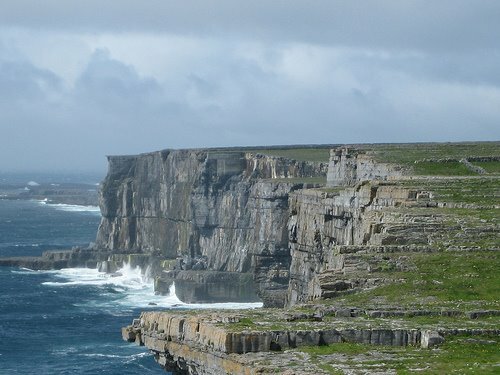 The countryside around Galway and Clare is rugged and beautiful and the Aran Islands are a must-see day trip. Some tourists go full throttle on the hiking gear when traveling in the Irish countryside, but the locals don't usually, unless they're seriously engaged in a technical sport. Although rugged, the countryside is mostly gentle, so a comfy pair of boots with good grip (for the slippery rock) should see you around. 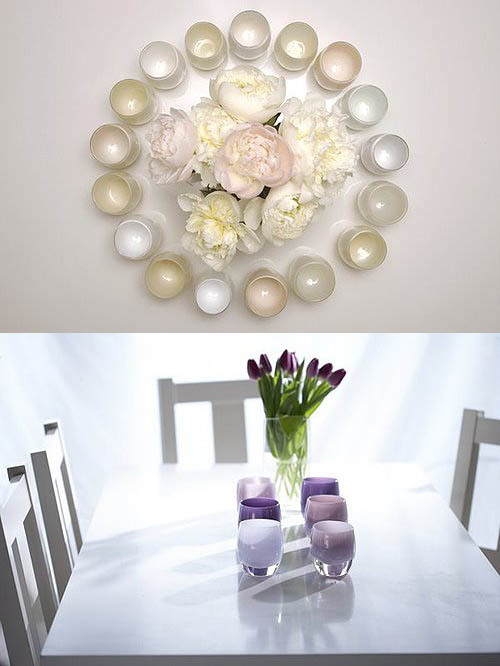 Even for more formal dining or theatre etc, you won't need to dress uber-glamorous. A laid back summer dress will be perfect for dining and trad sessions in pubs. At some point, I highly recommend a weekend drive down to Co Clare, hugging the coast as you go. It's a beautiful stretch of road, and you could do a whole lot worse than land in Doolin town for a night! Have a great summer Caroline!! Products (top image): Dress by Eryn Brinie from Revolve, cardi from Toast, umbrella from Pare Umbrellas, Claddagh ring, map of Ireland, earrings by Abigail Percy, sneakers from Jack Purcell, swimsuit by Toast, skirt by Stewart & Brown, sandals by Modern Vintage from Shopbop. Today's flowers! 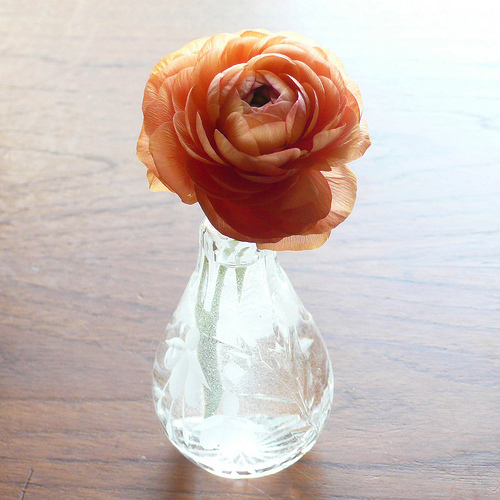 Roses, freesia and ranunculus, displayed in my wee Coe & Waito collection, which I nabbed at The Gardiner after Christmas at 50% off! It was raining when I was out this morning and I was feeling a little flushed and feverish. So, I'm going to make some tea and take it easy for the rest of the evening. The black piping on this lovely ensemble from Dessous by Sophie Simmons kicks it over the edge for me. Just lovely. 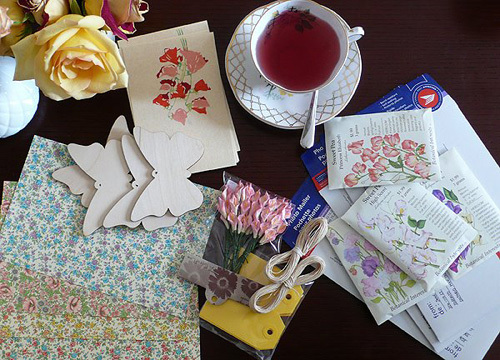 After my morning coffee and cracking the first few pages of a new book, I headed down to the Japanese Paper Place and picked up some bits n' bobs for my sweet pea giveaway packs. Afternoon tea (blueberry lagoon from Tealish, so tasty) and sorting through the packs was so much fun! Hope you're having a lovely day! 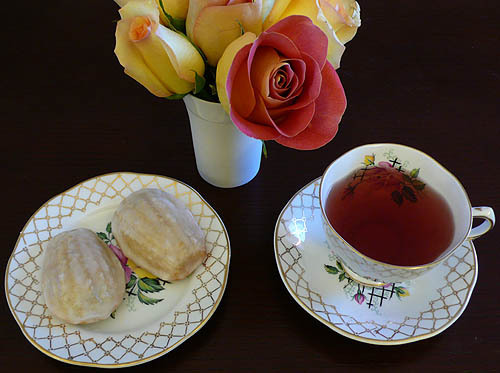 And I treated myself to a Spring treat from Red Tea Box too. Irresistible! There were times this week when I was certain I was a day further along and gutted to find out that I was in fact a day behind. But hopefully I've got it now, and it really is Friday and I have a blissfully plan-free weekend ahead of me. I plan to do nothing more than pick a new book and take it to the coffee shop. The rest, all fun I hope, will be spur-of-the-moment. What are you up to? Hope it's a divine one! The Sweet Pea giveaway winners are: Julianna, What Possessed Me, Michelle and Annady! Congratulations! 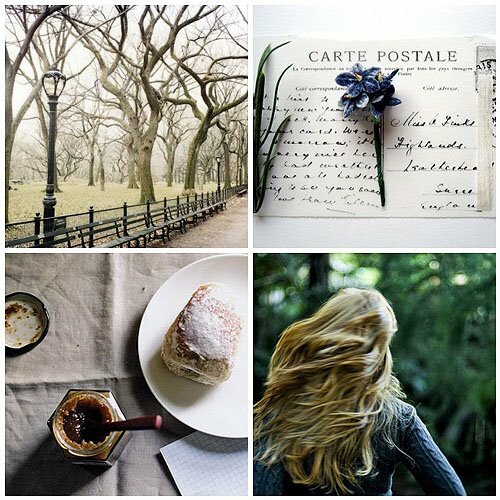 For those who don't know: My Tumblr, 'Fondly Seen' is where I stash inspirational images. Each image links back to its source, so it's also a good way to navigate to some hot new bookmarks around the blogosphere and beyond. Many moons ago, I left the comment "Animal Crackers!" over on Diana's inspiring blog and won a mystery prize. 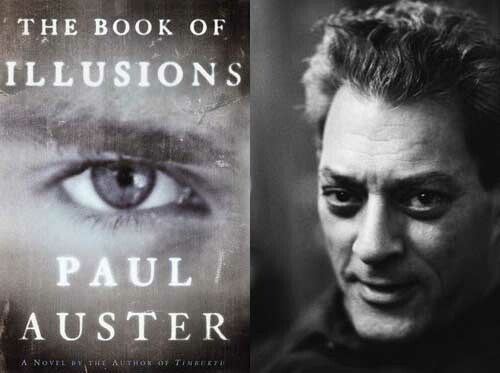 While some people have celebrity crushes, I have writer crushes... most notably Beckett and Paul Auster (who bear no small resemblance in work and appearance). Here's why I love Auster: He often takes classic American themes like movies or spy novels, sets his story in American cities, and engages in a very European philosophical style of story-telling; a style you might readily associate with continental writers like Beckett, Calvino, Kundera, even Kafka. But it's an appropriate method. Aren't writers metaphysical spies? Aren't we all a mystery to ourselves? His stories have layers and layers of complex ideas to return to, but also characters to love and a narrative to wholly absorb and transport. Thanks Diana! You're the greatest. American Vintage is up there with James Perse and Trove and my other so-soft-it's-ridiculous favourite brands. Perfect tees are a very important item in my wardrobe and I'll search high and low for the right style. I like a wider neck, a longer sleeve and body. 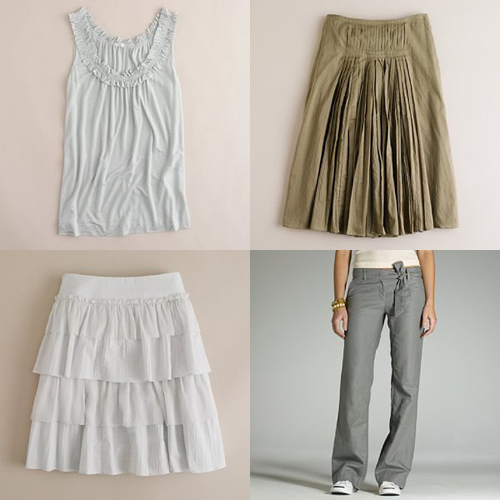 And, of course, ridiculously soft... Do you have a favourite perfect tee brand or style? 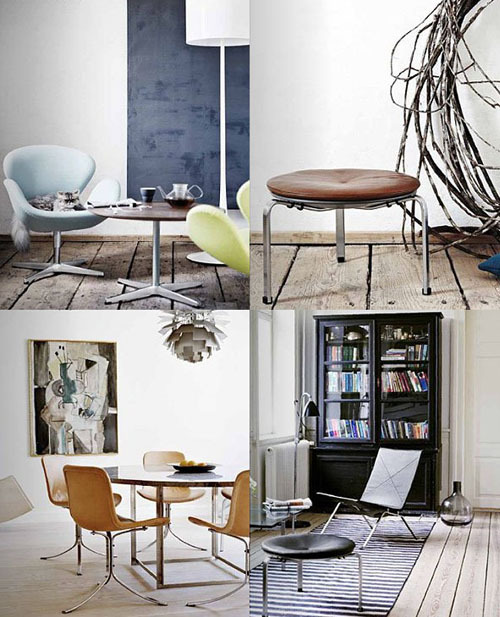 Some lovely shots from the Fritz Hansen catalogue. I would happily take one of every chair, and that stool too! I caught up on some framing last weekend and rearranged the wall behind my sofa yet again. I'm really loving my apartment these days. Perhaps all the recession talk has taken the shine off the idea of buying, or maybe it's because I don't anymore think of all the things I need to do when I look around. I always wondered if I'd hate being done. But I don't. I love it. And, of course, you're never completely done. New layers will be added and taken away. 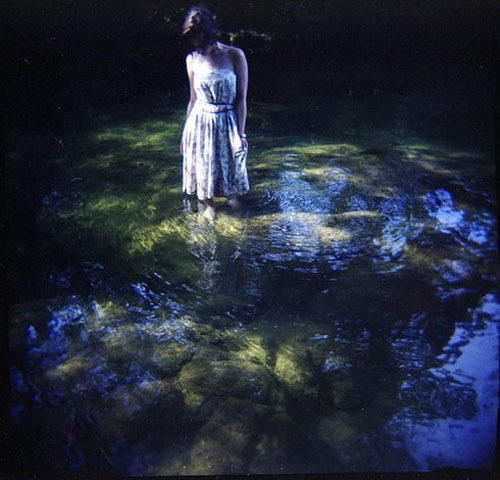 But it feels, right now, that all that can happen at a gentler pace. You know the old adage that your entire life can be based on a decision you made in your teens? I always thought that didn't apply to me. I was never one of those people who always knew they would be a doctor or lawyer and focused their entire life's energy on that. Nor did I marry my teenage sweetheart. Not that there's anything wrong with making those decisions, but that just wouldn't be me. As a teen, I would even have balked at the idea of living outside of Ireland... emigration seemed like a small tragedy to me at that age. Still, there are other ways that the decisions made then became the foundation of my life: Types of boys I dated and dynamics cultivated with friends and family. Even art, books and design styles. At best, these things became integral parts of my identity, elementary pieces of me. At worst, they became recurring mistakes I got pulled into making over and over. It's easy to feel doomed to accept these things as unchangeable parts of yourself. But, in the last few days, I suddenly felt the power to correct one error or misjudgment I made way back when. I've been able to start over in an area of my life that I've always assumed I couldn't. It's a nice feeling for Spring. It fills me with hope. I discovered Mariona Gen at TNT over the weekend and loved the folksy, feminine details in her collection. Tonight, I bought four packets of different Sweet Pea seeds. Just on a whim. I don't have a balcony, let alone a garden. 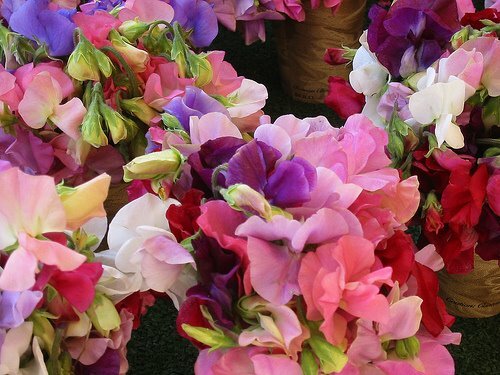 But I often fantasize about growing sweet pea again. And they're never available at the flower markets here. So, I thought if I can't experience the pleasure maybe one of you can enjoy them just as much! If you have a garden and want to try growing these seeds, just leave a comment and you could get a little package from me! I'll throw in some other fun bits. It will be a surprise! I'll draw four winners at random on Friday, say noon my time. Don't forget to leave an e-mail address if your profile doesn't link to one! Because of my spending fast, and my fast-approaching vacation, I haven't acted upon my bedroom plan. I think, at this stage, it will turn into a Summer project. 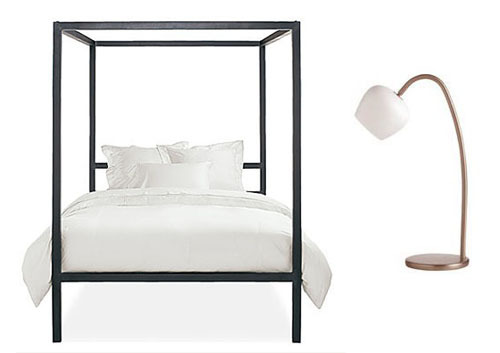 Still, I am thinking that I might nab the Habitat bedside lights when I'm at home and rewire them over here. Should be easy, right? The most difficult part is the bed. 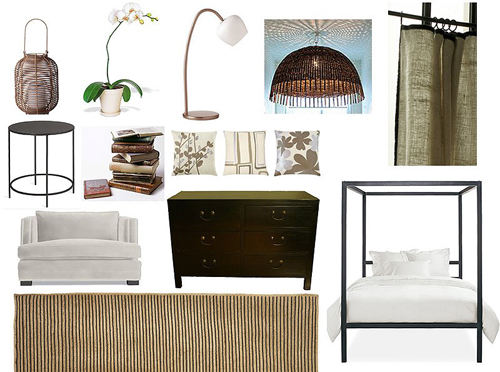 The one I want is from Room & Board. I've even e-mailed them and asked them to open a store in Toronto. I have no shame. Beds are hard! And, what's harder is finding the perfect one at the perfect price and not being able to get it. Bah! And for the pendant, I found these via amazing Nibs and I absolutely love them, but again I haven't been able to find something similar in Toronto (but it's not like I'm hanging around garden centres, so I might just have to look harder). I have ideas that these should be easier to find in Ireland, which no doubt means they'll be impossible to find there. Why is that always the way?! 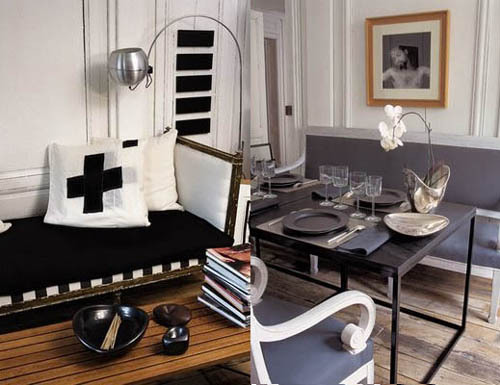 For the sofa / armchair, I'm thinking about going in a somewhat different direction, inspired by these two photos from Interiors. Let's face it, I'm hardly going to be sitting on this sofa at all, so cushiness isn't that important. And this might be soften my distinctly laddish taste?? So, I broke my spending fast. But, I don't feel too bad about it. I was really struggling with shoes the last two weeks. I hurt my foot and it ruled out wearing most of my favourite flats. So, I thought it through last night and decided that I needed shoes and also set myself a spending limit, which was significantly lower than my usual shoe limit. 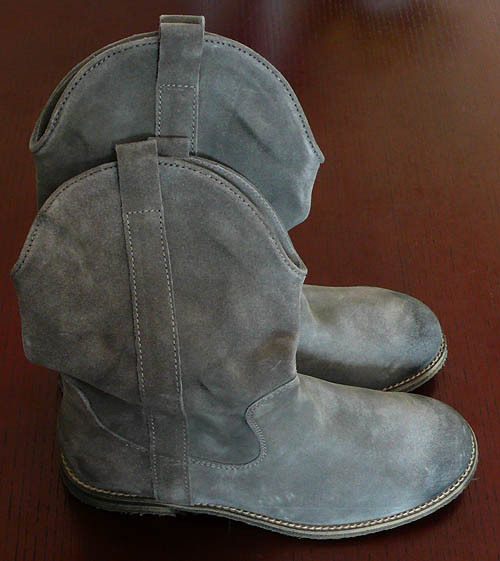 So, these are my new Spring boots, which I bought at Capezio. (They're quite reminiscent of a more expensive pair by Osmose, which I've been oogling at TNT). M2K2 don't have a site launched yet, but you can see some of their gorgeous pieces on Revolve and many other retailers. It must seem to you that I admire the same things over and over, but I love the gentle greys, from dove to charcoal and the little up-close details on their pieces. Just the right amount of femininity for my taste too. I had a little Proustian moment today and decided to bake up some Vanilla & Rosewater Madeleines, which I'll share at work tomorrow (Okay, I ate two, but that was just testing and they passed with flying colours). I got the recipe from a recent edition of Donna Hay (Issue 41) and I got the baking tray from Williams Sonoma. 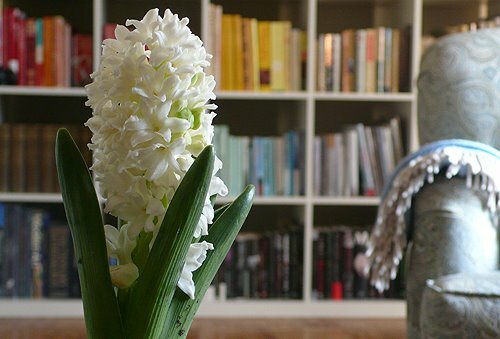 One of the best things about grouping vases is the ability to include flowers that have different lifespans and preferences, like water temperature. 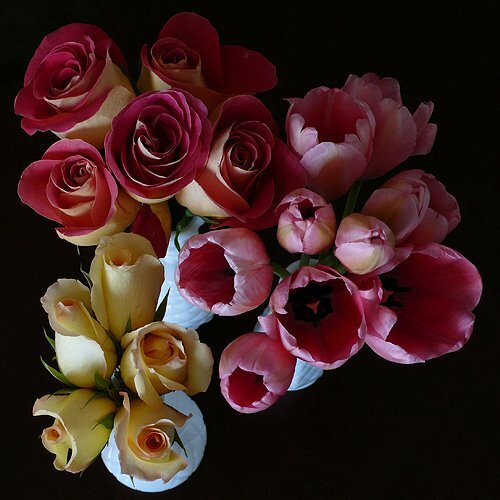 I couldn't resist these tulips and roses today even though I knew the tulips will wilt faster than the roses. This time of year, flowers look so good I don't feel much like doing anything to them other than plunking them in a vase. The new Reiss collection is finally online (I've been stalking their site incessantly!) and I really, really, really love it. Here are some of the looks. 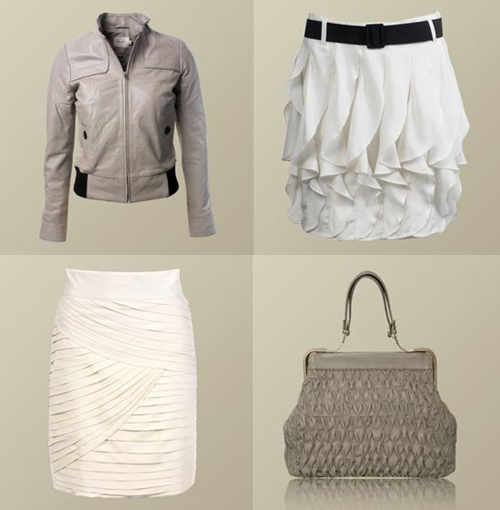 And these are my favourite four pieces. Oh those skirts! Those skirts! 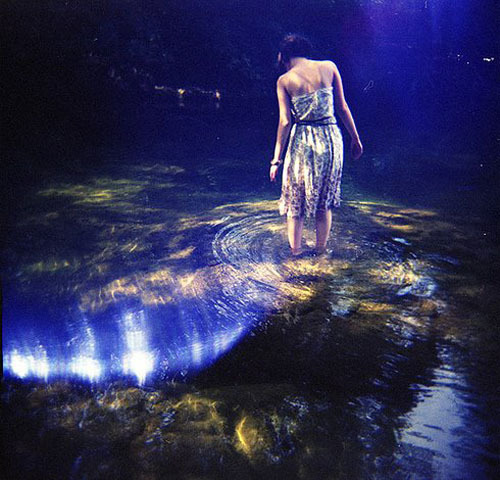 I'm completely gaga for these two images from snjezana. 's Flickr and thought you might feel the same way and enjoy them this Saturday morning. She has many more incredible images in her photostream (I favourited a gazillion of them) so take a wee looksee when you get a chance! Earlier in the week I had one of those horrible moments when somebody you don't like decides to tell you exactly what's wrong with you. As I sat there listening, I was already discounting what was being said. But, it got under my skin, as mean people always do. But yesterday was one of the funniest days I've had in so long, I laughed and laughed and laughed. On the subway home, I was still giggling. I hope my weekend is more of that and less of the meanies... And I hope your weekend is too! I found Grace Sun through Revolve and fell for the little details in this collection: Horizontal pleats, exposed zips and bejeweled necklines. If I ever started buying Glassbabies, I would never stop. I'd want lots. In many, many colours. Different ones for every season, to display every hue of flower, to cater to my every whim. 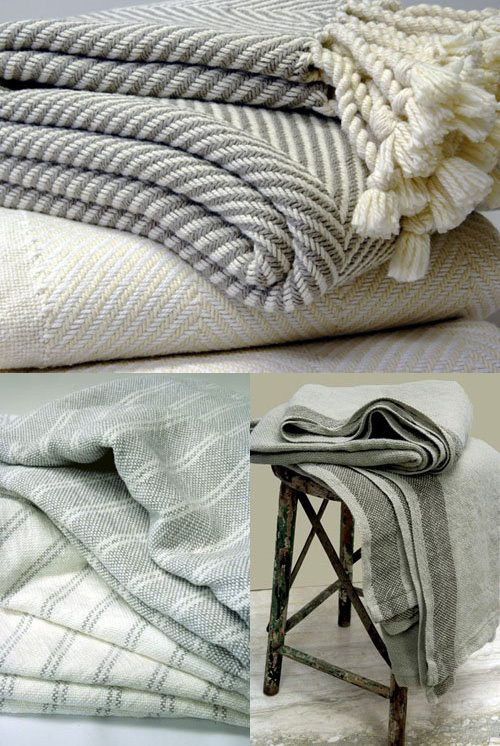 I love the origami folds and gentle draping of Maxine Dillon's Spring collection available at Revolve. Charlene Mullen's embroidery has blown me away completely. She uses traditional techniques like Elizabethan blackwork and folk design, applying them to modern subjects, like the London skyline, seen here. I was surprised that I loved so many items from the latest Twenty8Twelve collection. Not that I'd rule out a celeb-designer on principle, just that they usually prove to be not quite my cup of tea. I'm still not sure I would purchase anything from a celeb designer though. What do you think about them? One of my favourite weekday desserts is a red grapefruit chopped up, sprinkled with some Demerara and quickly blasted under the broiler. 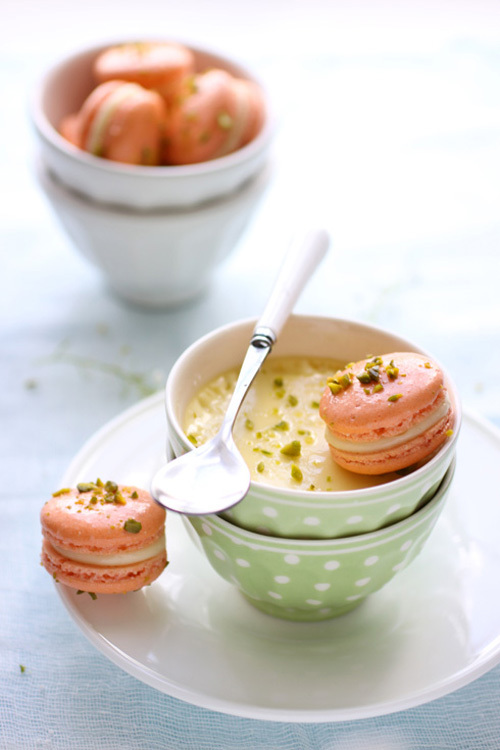 So, my lips were positively smacking with delight when I saw this on Cannelle et Vanille today. 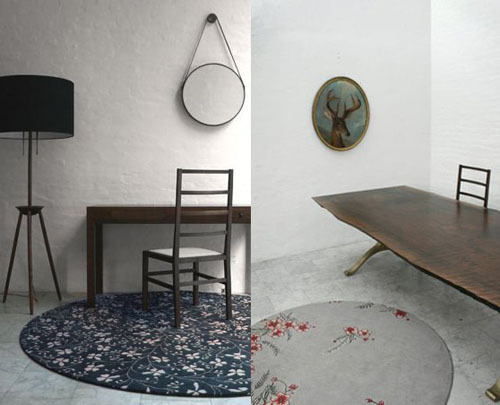 I'm suddenly crazy about round rugs, which is a little unfortunate since they aren't the easiest to find. I think I'd like one for my bedroom. These ones are from BDDW, one of my favourite furniture companies. I have the day off work today! Just planning a gallivanting day, likely to grab some flowers and a tasty something for lunch, read my book and soak up the amazing sunlight we've been getting, perhaps take my camera for a jaunt too. Maybe we'll venture up to the rooftop at the Hyatt and have a cocktail later on. 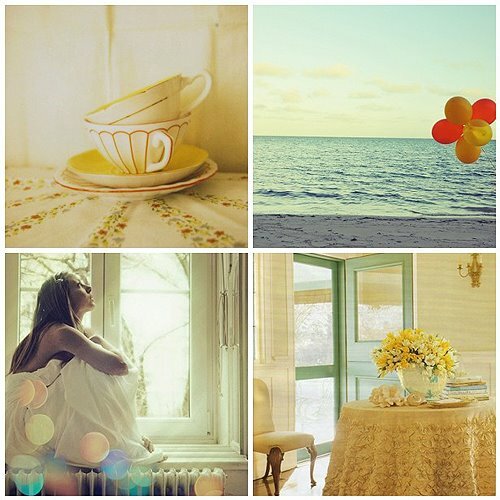 But, all in all, a quiet day for this quiet woman. Beannachtaí na Féile Pádraig! 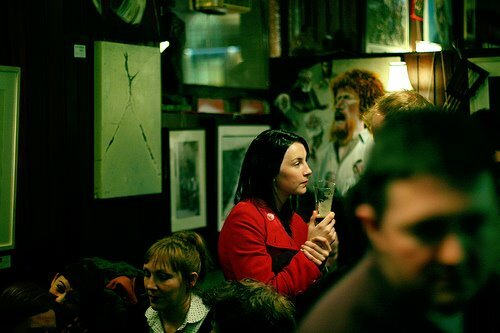 Photo from here, taken at my favourite Dublin pub. These are new from F. Troupe at Revolve and I think they're pretty fabulous. It's been a while since I cracked open a new poem. I read this a few times on the weekend. It's by Mark Strand. If I had a sudden windfall, I would hire Domestic Architecture to build or renovate a house for me. 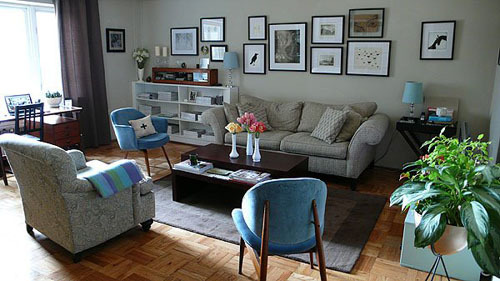 I blogged about this house before. Their spaces not only fill me with lust, but every room gets me excited what I would do to finish the space if it were mine. They lay the perfect foundation for everything I would want. After wandering over to their site today, I fell completely in love with this restaurant.